The Canary Islands, or las Islas Canarias in Spanish, are located off the west coast of northern Africa and enjoy a sub-tropical climate referred to as “eternal spring.” They are a popular tourist destination for Spaniards and foreigners alike and have varied terrain and interesting volcanic landscapes. Four of Spain’s national parks are located in the Canary Islands which include seven islands of varying sizes: Tenerife (the largest of the islands), La Palma, La Gomera, El Hierro, Lanzarote, Gran Canaria, and Fuerteventura. Currently, the economy of the islands depends primarily on tourism, however, bananas and tobacco are also grown and exported, as well as sugar cane and a number of exotic fruits. The islands were “discovered” by Spanish explorers in the 14th and 15th centuries and were conquered by 1500. The Guanches were the group of white-skinned natives who inhabited the islands before European explorers landed, but unfortunately, their race and culture were quickly wiped out. The economy of the islands has had its ups and downs and many waves of emigrants ventured to Central and South America, primarily to Venezuela and Cuba. After spending years working in the Americas, many would return to their homeland and bring with them a part of the Latin American culture. Because of this, there has been a long tradition of cultural exchange between the islands and the Americas. The cuisine of the islands is a mixture of some native Guanche elements, as well as Spanish, African, and Latin American foods. Historically, the islands were the first stop on Spanish soil as ships returned from the Americas, and thus they began growing and incorporating foods from the Americas into their diets, such as potatoes, beans, tomatoes, avocados, papaya, maize, cocoa, and tobacco. Other foods from around the globe were brought to the islands by sailors, and as a result, the banana (of Asian origin) became a staple in the canarios diet, where it is served fried or made into tarts, served with rice, eggs, or meat sauce. Staples of the cuisine include fish, corn, and bananas. Varieties of fish include wreckfish, damselfish, dentex, sea bass, white sea bream, bogue, mackerel, and parrot fish. Fish are typically prepared in three different ways: covered in salt and fried, baked, or jareado (sun-dried and seasoned). The varieties of fish eaten on the islands, as well as the fruits and vegetables that are locally grown, are not generally grown on the mainland of Spain, including a variety of banana called la gomera, which is small and aromatic and used as an important export crop. A wide variety of fruits are available including papaya, melon pear, peach, mango, avocado, and pineapple. The most popular dishes in the Canary Islands range from hearty stews to sweet desserts. Puchero canario: This stew is similar to the cocido madrileno in that the broth of the stew is drained off and eaten as a soup for a first course, while the second course is the meat and vegetables from the stew. The difference between the stews lies in the ingredients. The puchero canario is made of pumpkin, cabbage, sweet potatoes, pork, and beef. Papas Arrugadas: "Wrinkled potatoes" are a popular side dish consisting of small potatoes boiled in salt water until soft, leaving the potatoes with wrinkles and with a salty crust. 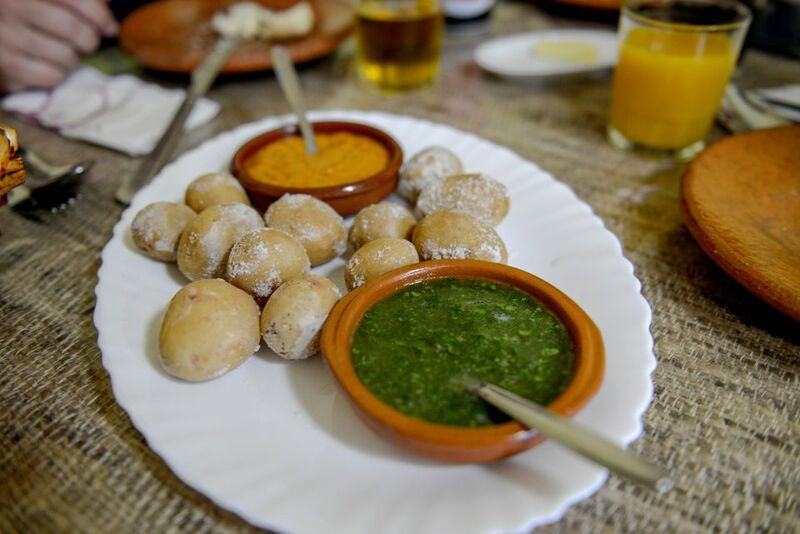 Mojos: These sauces are served with potatoes, meat or fish. The two most common types are mojo picón (red-pepper sauce), made from dried red peppers, and mojo verde (green sauce), which can be made from coriander, cilantro, or parsley. Sancocho: This fish dish is made with parna, a type of bass, boiled with plain or sweet potatoes and served with a spicy sauce, normally mojo picón or mojo verde. Conejo al salmorejo: This rabbit stew with tomatoes is eaten with papas arrugadas. Bienmesabe: This tasty almond-cream dessert is made of honey, ground almonds, cinnamon, and egg yolks. Truchas de Navidad: These small pies made with sweet potato and almond filling are traditionally eaten during Christmas and Carnival, a celebration just before Lent begins. For hundreds of years, wine produced in the Canary Islands was very popular with upper-class Europeans, however, this type of wine fell out of favor in the 1700s and wines produced in France and Portugal became popular. Today, the traditional sweet Malmsey wine is produced on the island of Lanzarote in the volcanic fields. There are 10 wine Denominations of Origin on the islands: Abona, El Hierro, Lanzarote, La Palma, Tacoronte-Acentejo, Valle de Güimar, Valle de la Orotava, Icoden-Daute-Isora, Monte Lentiscal, and Gran Canaria. In addition, winemakers have experimented with making a sparkling wine from what is called the gomera variety of banana. The islands also have their own local drinks, such as banana liqueur, or honeyed rum.